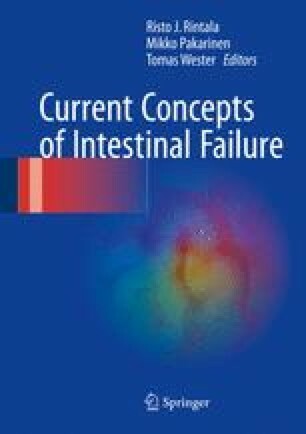 Intestinal failure (IF) is a condition in which severe intestinal malabsorption requires parenteral nutrition (PN). Causes of protracted intestinal failure include short bowel syndrome (SBS), congenital diseases of enterocyte development (CDED), and severe motility disorders (total or subtotal aganglionosis or chronic intestinal pseudo-obstruction syndrome). IF can result in “nutritional failure,” defined as the incapacity to continue to feed a child by using PN. Today, intestinal failure-associated liver disease (IFALD) is the most common cause of nutritional failure, but catheter-related sepsis and extensive vascular thrombosis may also jeopardize the use of long-term PN. For a child with nutritional failure, intestinal transplantation (ITx), often in the form of a composite visceral graft, offers the only option for long-term survival. The management of IF requires a multidisciplinary approach. There have been a number of recent advances in both medical and surgical treatments of IF. In particular, new intestinal lengthening techniques and the use of parenteral nutrition formula rich in fish oil have both resulted in decreased rates of severe complications of IF and its treatment. In addition, improved awareness of the risks and benefits of ITx have resulted in better patient selection, and ultimately in improved patient survival, leading to restrict the indication to ITx only to patients with nutritional failure with no other chance to survive. Müller T, Rasool I, Heinz-Erian P, Mildenberger E, Hülstrunk C, Müller A, et al. Congenital secretory diarrhoea caused by activating germline mutations Congenital secretory diarrhoea caused by activating germline mutations in GUCY2C. Gut. 2015. pii: gutjnl-2015-309441. doi: 10.1136/gutjnl-2015-309441.